In this lesson, we will walk you through filing your Articles of Organization with the South Carolina Secretary of State. This is the document that officially forms your South Carolina LLC. 1. Online: the filing fee is $125 and your LLC will be approved in 1 to 2 business days, however, most filings are approved the same business day. 2. By mail: the filing fee is $110 and your LLC will be approved in 1.5 to 2 weeks. We like the online filings since it’s much easier to complete, and the approval time is much faster. However, if you want to save $15 and don’t mind the wait, then you can file by mail. You will find instructions for both the mail as well as the online filing below. Important: Before proceeding with this lesson, make sure you have searched your South Carolina LLC name and selected your LLC’s Registered Agent. 2. Enter your email address, create a password, and click “Continue”. Make sure to keep this information in a safe place. 3. Go check your inbox and look for the email the state has sent you. Click the “Complete your registration” link to verify your email address. You’ll then be redirected to a confirmation page. Click the “Login” button to proceed. 4. Login with your email and password. 5. Create 2 security questions and then click “Continue”. • To the right of “New Business”, click “Start a New Business Filing”. • Select “Begins With”, enter your desired LLC name, and click “Search”. Make sure to enter your desired LLC name exactly as you’d like it, including your desired capitalization and your preferred designator. Remember: If you haven’t read our LLC name search lesson, please do so first before proceeding. • When you find an LLC name that gives the result of “This name is available”, click the “Add New Entity” button to begin your filing. 1. Is the organization a South Carolina entity? 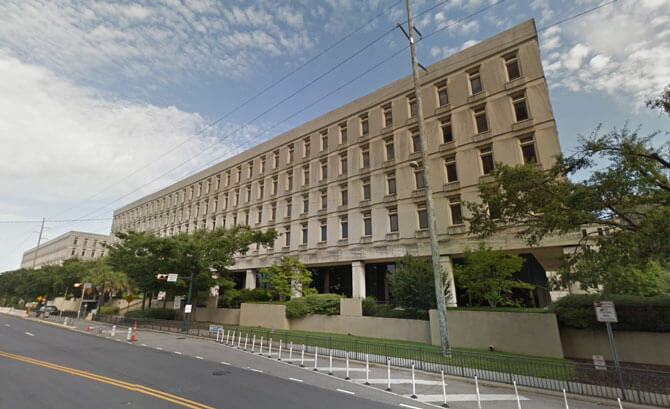 Most filers are forming LLCs in South Carolina. These are called “Domestic LLCs”. If that’s the case for you, then click the “Yes Domestic Entity” button. If you already formed an LLC in another state, and you are registering that LLC to do business in South Carolina, then click the “No Foreign Entity” button. Select “Limited Liability Company” from the drop down menu. “Available Forms” boxes will appear below. To the right of “Articles of Organization”, click the “Start Filing” button. Please enter your contact information and then click “Continue”. Make sure your desired LLC is capitalized the way you want it. And make sure your LLC name has the appropriate designator at the end (“LLC”, “L.L.C.”, “L.C.”, or “LC”). The designator “LLC” is the most common. Enter the name and street address of your LLC’s Registered Agent. The address cannot be a PO Box and the address must be located in South Carolina. Your LLC’s Registered Agent is a person or company who agrees to accept legal mail and court documents (known as “service of process”) on behalf of your LLC if your business is sued. You have 3 options for who can be listed as your LLC’s Registered Agent. If you have not read our South Carolina Registered Agent lesson, please do so first before proceeding. Enter your LLC’s office address here. This doesn’t have to be an actual office address. It just needs to be a South Carolina street address where the LLC is “located”. You can use your home address, the address of a friend or family member, or you can use an actual office address if you have one. If your LLC is member-managed, leave this section blank (do not check off the box). If your LLC is manager-managed, check off the “LLC has managers” box and add their contact information in the box that appears below. Most LLCs are member-managed, where all the owners run the business and day-to-day operations. An LLC can also be manager-managed, where one, or a few designated people, run the business and day-to-day operations (while the members play more of a passive/investor role). To learn more about member-managed LLCs vs. manager-managed LLCs, check out this article. Only check this box if one or more of the LLC’s members are going to be held liable for the business’ debts and obligations (as per section 33-44-303). Most filers choose to leave this blank. If you’d like your South Carolina LLC to have a perpetual existence, leave this section blank (do not check the box). This is what most filers choose and this gives them the freedom to have their LLC remain in existence until they choose to close it down (if ever). If you’d prefer your LLC to automatically be shut down on a specific date in the future, check this box off and enter your LLC’s future date of dissolution. If you’d like your LLC to go into existence on the date it is approved by the South Carolina Secretary of State, then leave this section blank (do not check the box). If want your LLC to go into existence on a future date, enter that date in the box. The date cannot be more than 90 days ahead. • You cannot back-date your filing. • If you’re forming your LLC in October, November, or December, and you don’t need your LLC open right away, you can forward date your filing to January 1st of the following year. This will save you the hassle of unnecessary filing and/or reporting on your personal tax return for those few months. For more information, please see LLC effective date. Enter the name and address of each person filing this form with the state. There only needs to be one Organizer, but you can have multiple Organizers if you’d like. From the “Who is signing this form” drop down, select “Organizer”. Check off the box that appears below (agreeing to the terms) and enter your full name in the box. This serves as your digital signature. Note: An Organizer is not automatically made a member of the LLC by signing this form (although they can be a member; but that’s done with a different form). Members are set in your Operating Agreement, which we’ll discuss later on. F0r more information on Organizer vs. Member, please read this. Click the “Continue” button at the bottom to proceed to the next step. • If your LLC will be taxed in its default status by the IRS (Sole Proprietorship or Partnership), you can just click “Continue” to proceed. • If your LLC will elect S-Corp tax status or C-Corporation tax status with the IRS, you also need to file Form CL-1 with the South Carolina Department of Revenue. Again, if your LLC will be taxed as a Sole Proprietorship or Partnership, you can click “Continue” to proceed. If your LLC will be taxed as a S-Corporation or an C-Corporation, click “Start Filing” to the right of CL-1. If you’re not sure how your LLC should be taxed, we recommend speaking with your accountant. If you don’t have an accountant, here is our recommendation for finding one. There is nothing to do on this page but click “Checkout”. Enter your credit or debit card information and click “Next”. 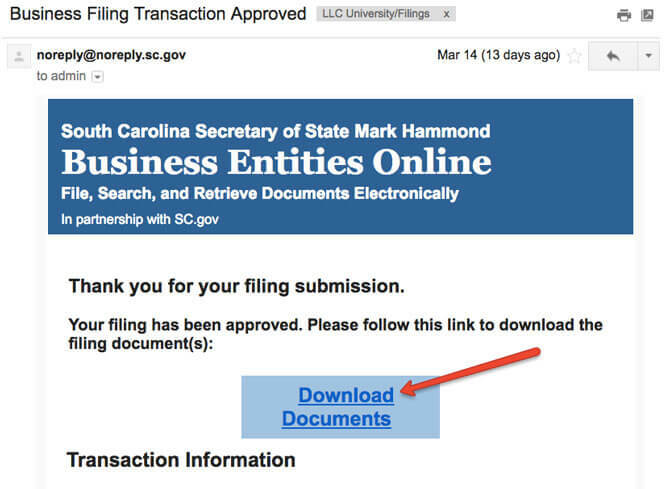 Congratulations, your South Carolina LLC has been filed online for processing! Now you just need to wait for approval. The state will email you in 1-2 business days after they review your filing. Within 1-2 business days, the state will send you an email. • If your LLC was rejected, they will explain why and tell you what you need to do to properly re-file. 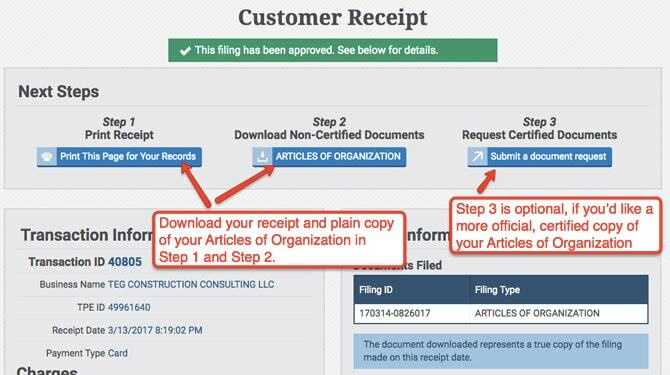 Step 3 (Request Certified Documents) is optional, but if you’d like a certified copy of your Articles of Organization, click this button as well. There is a small fee to pay. You’ll be able to download a certified copy of your Articles of Organization right after making payment. You’re finished. There are no more steps in forming a South Carolina LLC online. Please proceed to the next step. Please follow the instructions above for the online filing. The steps are exactly the same. The only difference is that you are entering the information into the paper form instead. When filing your LLC by mail, you need to send 2 copies of your Articles of Organization. Make sure both are completed exactly the same and that they have the signature(s) of the Organizer(s). Tip: you may need to use a medium-sized envelope if the above items do not fit in a regular #10 envelope. After South Carolina processes and approves your LLC, they will send the following items back in the mail: a stamped and approved copy of your Articles of Organization and a Filing Receipt. Once you file your Articles of Organization and it is approved by the state, you can then proceed to the next lesson: LLC Operating Agreement. If you have any questions, you can contact the South Carolina Secretary of State at 803-734-2158.